NOTE: The studies found that adding Listerine to a daily routine of dental hygiene is beneficial. The research team at the University of Buffalo School of Medicine & Dentistry did not claim that Listerine can completely replace regular flossing. The key findings of this research were that antiseptic mouthwash should be added to one’s oral health routine. There are, of course, those who claim that rinsing cannot compare to flossing. A factual statement asserts that string flossing involves mechanical scraping, and mouth rinse does not. For this reason, products such as Listerine are only capable of softening the plaque. This process would still kill some microorganisms, but debris of the plaque will remain. Proponents of flossing entertain the thought that only mechanical debridement has the ability to completely remove accumulated plaque. 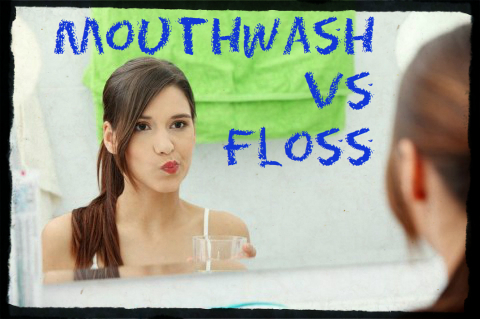 Mouthwash rinses may be able to kill the bacteria that resides on the surface of the plaque. However, it will have zero to no effect on the bacteria and microorganisms that live inside the dental plaque. The main reason why people choose to rinse, rather than floss, is because it is easier. String flossing can be time consuming. Also, some research has shown that only about 5 percent of people who floss, actually do it right. This is why there are so many studies that easily and readily discredit flossing.